Okay, let me be honest. The only reason that I watched this movie was because I was waiting to see Logan and this fit the time frame perfectly. I was not going to watch it otherwise. Bodi (Luke Wilson) wants to be a musician, but his father (JK Simmons) wants him to follow in his footsteps as a guard dog protecting the sheep village from the wolves. Taking his chance to become a musician, Bodi meets famous rock star Angus Scattergood (Eddie Izzard) who is having trouble creating a new song and Bodi becomes his muse. There is nothing special about Rock Dog, but it was an okay film. It is a solid little family movie. It is predictable, for sure. The writing is pretty basic. The characters are okay. I liked Angus, though he is pretty cliche. The voice acting was decent. JK Simmons is always great. Luke Wilson is good. Eddie Izzard does a great job as the rocking cat. Lewis Black is always good and this is no exception as he played one of the head wolves. Plus, Jorge Garcia is in here! Jorge, Hurley from LOST, is one of my favorite people and he is always a wonderful person. The music was okay. I did not hate anything involved in this movie. It just is not anything special. The thing is… I really thought this was going to be bad, and it was acceptable. I don’t have much else to say about it. 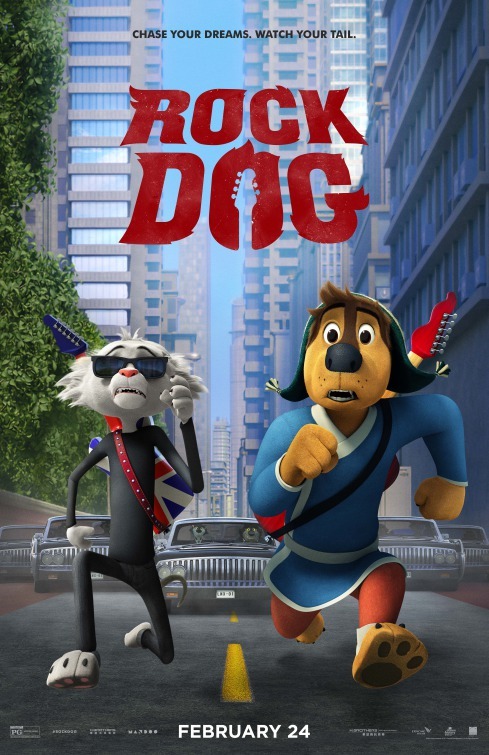 If you have kids, Rock Dog is a good film to pass the time with, which is exactly what I did.